On Friday 15th June, I ventured down to London for the David Gemmell Legend Awards at The Magic Circle. I’d booked a smart hotel, had a new frock to wear and was quite looking forward to the whole thing. It’s not often I get to dress up and go out to play. The evening started well: I was ready on time, wafted through the hotel reception and got the concierge to hail me a cab. I felt very glamorous in my long dress and floaty wrap but it all came unstuck somewhat when the cab arrived. As I got in, my knee decided it didn’t want to play anymore and folded under me, leading to a very inelegant heap of author, walking stick and handbag on the floor of the taxi. Ho-hum. Arriving at the ceremony, I almost repeated the performance. The cabbie, bless him, gave me his arm to get out but as I walked across the street to say hello to some folk from my publisher, I stumbled on the cobbles and Simon Spanton had to catch me before I measured my length on the pavement. Simon and I are now thinking of taking our “drunken sailor” act on the road. Alas I didn’t win the Morningstar award that I was shortlisted for – that honour went to Helen Lowe for The Heir of Night. 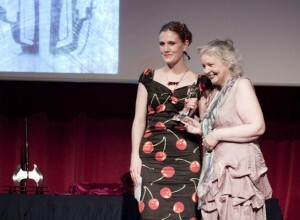 As she lives in New Zealand, the lovely Jenni Hill from Orbit collected the award on her behalf. Nonetheless I got to see my mugshot in the programme and quaff copious amounts of bubbly with old friends and new. Sadly, I also missed out on saying hello to quite a few more – the room was packed! I almost came away with a very nice piece of memorabilia from the auction. I bid on an original Didier Graffet pencil sketch (the bearded axe off the cover of Joe Abercrombie’s The Heroes) but chickened out when the bidding went north of £100 – and promptly got told off by my husband for being a wuss. I’m really regretting not bidding higher; the price it eventually went for was a steal for a piece of original artwork, and all funds raised went to support the awards. Be braver next time, Ellie. By the end of the night my feet were killing me, even in sensible low-heeled shoes; I don’t know how the Queen manages it. I shared a cab back to my hotel with my agent and his wife, Jo Fletcher, having had a thoroughly marvellous evening. Roll on next year! Cheers, Anne. No-one was more surprised than me that I made the shortlist, but I was up against some serious competition. I think I was bidding against you for that drawing, but I too chickened out at 100. Maybe if I hadn’t just forked out a grand for two plane tickets I might have been braver! Commiserations on not winning, but it’s still great that you made the shortlist.